I’ve associated Italian food too closely with pastas in the past. Pastas which are usually done in such a pedestrian way at most places that its become the backup plan, never the goal. Like chow mein, there’s little surprise to it. 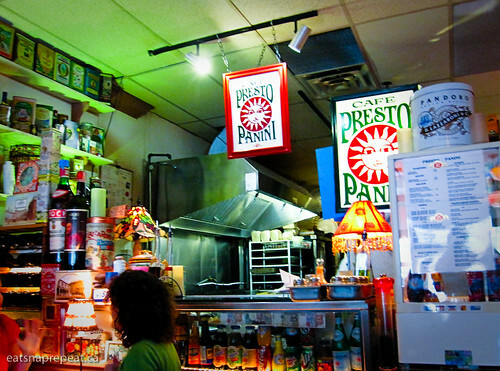 Presto Panini on Hornby showed me I simply had my eyes closed. 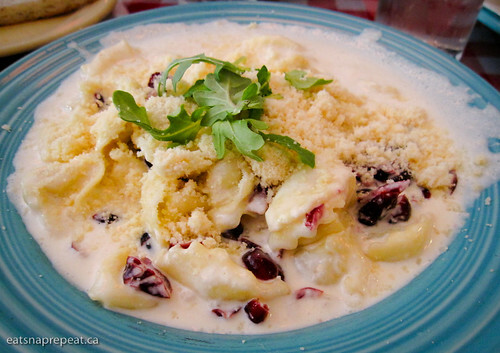 I really enjoyed their lunch combo of minestrone soup and cheese tortellini in fresh fruit cream sauce. 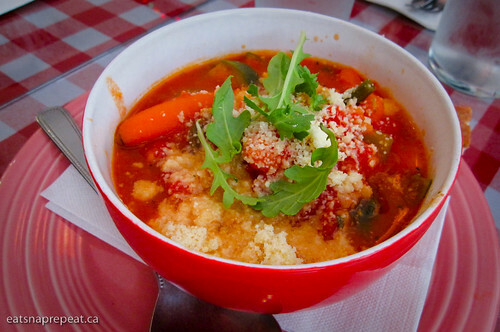 Topped with fresh parmesan, and about two servings of vegetables in the bowl, the minestrone soup is a hearty meal on its own. This is one of the most interesting sauces I’ve had. In a good way. (I’ve been accused of using the word ‘interesting’ too often). Admittedly, I have no idea how the sauce is made. Its pure cream. Thick and a little foamy. I went with the cranberry topping this time, but had it with fresh mangos on a previous visit. I cannot imagine a better pasta to eat on a hot summer day while sitting in a tiny Vancouver cafe. The sauce is light and airy. The slightly sweet and fragrant bits of grated cheese is well complemented by the tanginess of the fresh fruit. Its a small operation, one lone chef, closes early (7pm), crowded most of the lunch hour, great authentic Italian food, no twitter. In almost every town/community/plaza I find at least one “Chinese”-looking restaurant (has bamboo fonts on their signage but only English lettering) and try to stay as far away from as possible, knowing that there is nothing Chinese about the food served there other than the soy sauce. But thanks to our multicultural population, authentic Chinese restaurants are readily found in Vancouver. Those south of the border, however, aren’t so lucky. Here’s an interesting talk I think foodies will appreciate. It sheds some light on how these “Chinese” restaurants came about. btw, that’s the worst youtube snapshot pic I’ve ever seen. Her blog also has more resources on the topic. ….we’ll get sued for using that eventually.